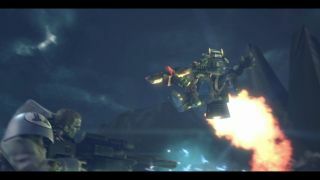 Warhammer 40,000: Dark Nexus Arena was announced in February as a MOBA/twin-stick shooter crossover that will pit teams of Space Marines, Orks, and Tau against one another in four-on-four battles. It entered closed beta testing in May, and today developer Whitebox Interactive announced it will launch on Steam Early Access early next month. Unlike conventional MOBAs, Dark Nexus Arena does away with lanes and towers, leaving players to slug it out in "a more open battlefield" that's a better fit with Warhammer 40,000's dark future setting. It also employs a "skill shot-based control scheme," which gives players the ability to dodge attacks and take cover behind walls and other characters. "With no bases to destroy, the first team to capture the Dark Nexus three times in a match wins," the studio explained. "Coordination with your team is key; with no bases to return to and heal at, players must rely on their support characters to restore their health and their tank characters to be at the forefront of a battle, soaking up the damage." Warhammer 40,000: Dark Nexus Arena will arrive on Early Access on December 9. Until then, you can find out more about the game at darknexusarena.com, and enjoy a nice pile of screens below.